Download our Estate Planning Questionnaire: (PDF) (Word). We ask that all clients fill it out before an estate planning consultation. The questionnaire both aids clients in thinking about their estate plan and ensures that we get all the information we need to develop a comprehensive approach for each client. Sound legal advice is the cornerstone of an estate plan. Most Virginia estate plans include a Will or Trust, Durable General Power of Attorney, and Advance Medical Directive. Understanding the purpose of each of these documents helps clients decide what is right for them. What do these documents provide for? 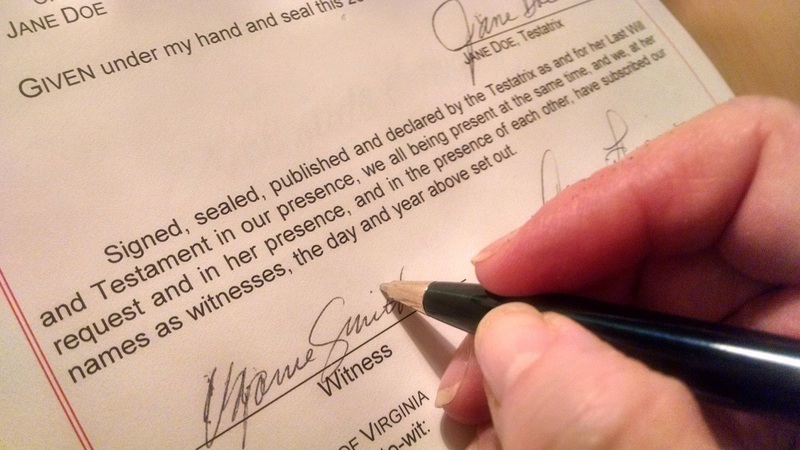 A will or trust may be the first document that comes to mind for many clients when they think of estate planning. A will or trust provides, at minimum, two directions: (1) which assets pass to which beneficiaries and (2) who is in charge of that process (an executor in the case of a will, a trustee in the case of a trust). These documents can also nominate a guardian for minor children, minimize taxation, and provide for a continuing trust. Every client should get one or the other – but which? A will is easier to create than a trust but is not as flexible as a trust. Assets that pass through a will must be probated through court: the executor must qualify in court, file an inventory of assets, and provide a detailed annual accounting. Wills can be a reasonable choice for clients with uncomplicated financial and family circumstances, especially for certain married couples. Indicators that a trust is a better fit include out-of-state property, assets unusual in type or quantity, and intended beneficiaries other than a spouse or children. A trust is more flexible than a will, and is often both a net savings and easier to administer than a will. A trust, in many instances, greatly reduces or eliminates the costs of probate. Simple trusts are also generally easier to administer than wills, saving time for the trustee. ​Trusts are rarely an unreasonable choice, and some estate planners recommend trusts for all clients. Clients who choose to have only wills prepared often do so because wills are simpler to establish and amend. Every Trust should typically be accompanied by a companion Will that deals with any assets that fail to get placed in the Trust. A power of attorney designates someone who is empowered to make all financial decisions on behalf of the client. This prepares for a possible situation where a client is unable to act on their own behalf, whether due to absence or incapacity. A power of attorney is, in some ways, like insurance. Clients hope that they never become incapacitated. But if they do, a power of attorney often will prevent the need to bring legal action to appoint a Guardian or Conservator and paying the associated exorbitant costs involved with those actions. An advance medical directive (some other states refer to them as “living wills”) designates someone who may make medical decisions on behalf of a client if they are unable to do so themselves. An advance medical directive also outlines a client's wishes, to guide the decision making of their designated agent. Clients commonly instruct that supporting care be withdrawn if the client is in a persistent vegetative state, making it easier for their agent to make what can be a demanding decision. Advance medical directives also make it clear which friend or family member is responsible to make a decision, avoiding litigation if there is a disagreement. Advance medical directives are in many ways a companion to powers of attorney, picking up where the powers of attorney leave off. A Will or Trust directs which assets go to which beneficiaries. A Durable General Power of Attorney appoints an agent to make financial decisions in case of incapacity. An Advance Medical Directive appoints an agent to make medical decisions if a client is unable to do so. These documents are only the beginning. Get in touch with us to schedule an estate planning consultation. We want to guide you in getting the right documents and taking the right steps to ensure you have a comprehensive estate plan. The above is general information pertaining to Virginia estate plans and does not constitute legal advice. Estate planning guidance varies from state to state.